This takes quite a long time to charge, but it works eventually.! Everything that I would have wanted to know was stated clearly on the item: I.e. the length of the cable and its performance. Wanted to know that it was as good as original Apply quality. It does what it should, perfect. I have only used this product a few times because it only works intermittently or when the cable is inserted at an odd angle. Not worth the money. 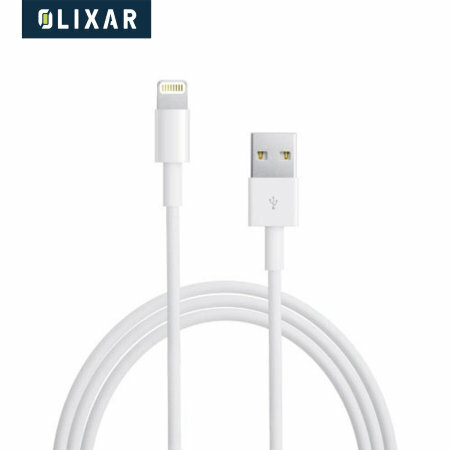 I have used Olixar cables for along time, always good quality and reliable. The extra length is useful to be able to use my pad while it is plugged into a wall socket charging while I am sitting in an armchair. My original one several years old was still working ok until the dog chewed the connector off! Actually, longer than one would envisage, but just the job and more length if I need to stretch a connection further. I bought 2 of these on a previous BOGOF and they are no good. I bought them for my son and they do not charge his iPhone 6S. By the time he told me some time had passed so I just took the hit, but I would not buy from Olixar again. It does what its supposed to do, it looks like a cable, what else do you want me to say? Continual request for recveiws are pointless,. If it was no good I would have sent it back! I bought these long cables to replace a couple of identical ones which stopped working - the wires had been coming away from the plug for some time - but then they just died. So ... they are very useful because of their length, but don't expect them to last for ever. Quick delivery, quality of item looks good, length of cable a real bonus. Works well and charges quick. that i could charge up my phone whilst playing my music when i was exercising with the sockets quite away from me it was ideal. I bought 2 of these cables and neither work with my Ipad. Display shows ‘not charging’. It would be helpful if description specified that it may only be suitable for Iphones. These cables should be fine with the iPad. What are you using as a mains power source? If this is under-powered, it could lead to problems. Please contact our Customer Services team so we can assist. This was delivered in good time. I’m happy with the purchase as the lead is long enough for what I wanted. Sorry to hear you had problems with one of the cables. Can you please contact our Customer Services team so we can investigate further for you. Just what I needed for charging my mobile in the car. Good value, exactly as described. I can't get over excited about cables. they vare as described and good value. The cables are of good quality and excellent. Don’t have many PowerPoints around the house and the extra length is brilliant. Better off buying Anker cables. Cables only lasted me four weeks, sent one back for replacement, received after a week, that worked for two weeks before giving up the ghost. I would not recommend Olixer brand, Buy Anker for REAL quality. Was just what I needed. Can now charge anywhere I want. Cable stops charging my iPad Pro. I bought this cable for my iPad Pro and it reaches about 80% charge,then suddenly stops charging.I use the original cable and same usb wall charger,without any problems.It would be nice for this cable to fully charge my iPad,because the extra cable length means I can sit anywhere in the room. I did not need to know anything extra as product was well described on your website. put one in your travel bag! ...iproducts come with only one cable, which you forget and leave at home when you go on holiday. Get one of these (or several), and you’re sorted! Useful that it is very long and so far so good! Although my iPhone 6s charges with this cable, I had bought it specifically to charge my iPad Air 2 and it does not. I get a message stating accessory not supported. Therefore it is not fit for the purpose it was purchased for. Excellent product. In-box cable far too short. Freedom from 1M Teter . But this now, Best Buy for a long time. I have had this cable now for about four months and it is still going strong. Very happy at first with the extra length cables. However after using for a few weeks the cables are beginning to show signs of failing. The area around the lightning connector is starting to come loose and plastic cover has a suspect bulge. Not sure how much longer they will last seems like something is coming apart inside this area. Not only does it fuction without warning messages but it is also a robust, quality product. Having this extra length means I can sit on my bed and still watch my iPad while it is charging. Allied with an extra fast charger, this is done in no time. I have been using this cable for a full week now , I have found no problems with it yet and is compatible with my IPhone 6 , no silly messages saying this cable isn`t compatible rubbish . Does the job brilliant and the extra length has proven very useful. These cables are excellent. Speedy delivery and very good service. Satisfied customer. I Bought a set of 4 cables. The lightning end just doesn't fit properly. They pop out of the phone really easily. The slightest movement disconnects the charge and you end up with a flat battery. Really poor fit. Pay more elsewhere for a decent cables would be my advice. I will be sending back and asking for a refund. Sorry to hear about this, it looks look you might of got some faulty cables, please contact customer services so we can address this issue. Works well and looks sturdy. Too rather a long time to arrive but it did eventually. The cable does not work on IPhones and IPads. Extremely disappointed as advertising is so blantantly misleading . Sorry to hear you had problems. We have tested this cable with both an iPad and an iPhone and had no problems at all, however can you please check the mains charger you are using with this cable as if it is under-powered, it can cause charging issues. Please contact our Customer Services team for any further assistance. Excellent value, prooves very useful when the iPhone needs charged but isn't near enough to the power socket. Received quickly. Appears to be good quality. The cable provides a great extension over the standard Apple lead and is of good build quality. It is not however suitable for kids. My teenage daughter destroyed it in three days. The strength of where the outer insulation enters the connector body is just nut strong enough for rough use. A genuine Apple lead is however tougher. So I'd say this product is great if you really look after it. Very useful product. Allows me to use my iPad without having to stay close to a socket. Great value too. Sorry to hear of this. Can you please contact our customer services team so we can investigate further. Excellent value for money , buy 2 get 2 free. As per usual, goods arrived quickly and were securely packaged. A great cable at a great length. Long enough to reach that all important plug socket down at floor level. Most useful in a lot of different situations because of the length that can be utilised. Good for holidays and anywhere that might need a long length. Good for hospital stays too. Please contact our Customer Services team and we will see if you can still qualify. Good Length - not working! Sorry to hear you have had problems with one of the cables. Can you please contact our Customer Services team so we can investigate further. These extra long cables are useful when you can't get near to a mains plug and your device batteries are running low. They are good quality and I have found them to be reliable. Well put together 3m lead ideal for use around the house. 2 for 1 deal makes this a fantastic deal. Even without the promotion, I would still buy this product again. unable to move around post Thigh operation. Very good cable. More heavy duty than the cheap ones and perfect length for caravanning where sockets are in shorter supply. Used it a lot for both iPhone and iPad. Working well. Never had a bad product from MOBILEFUN!! The fact that it is an extra long sync/charge cable is fantastic and the bonus is getting two for the price. The extra length of this charge / sync cable is fantastic no worries on pull the cable to far and it works perfectly well. Can charge and move around and saves plugging in to an extension lead. As always the delivery from MobileFun was fast and hassle free. Arrived fast and works well! I regularly FaceTime my family and often my iPad battery drains as a result. This 3mtr cable has proved to be the answer by allowing me to sit in a comfortable chair and still be able to plug the iPad into a mains supply. The cable is good quality and great value unlike some cheaper ones on the market. And 3 metres long enough to plug in under the bed and use while lying in comfort! I am happily charging my phone from sockets all over my house and I can keep an eye on my phone even though I may be sitting a few feet away. Great product. Great price. Exactly the right cable for the job.